RUB 1.8 million will be spent for Russia’s water transport infrastructure within the coming 6 years. This decision has been approved by RF Government and the President. A comprehensive plan for modernization and expansion of mainline infrastructure for a period through 2024 approved by the Government of the Russian Federation on 30 September 2018 has been presented to the President during his regular meeting with members of the Government. The document covers 11 federal projects including 9 project focused on modernization and expansion of transport infrastructure and 2 projects focused on modernization and expansion of energy infrastructure. The transport part comprises the following projects: Europe-Western China, Sea Ports of Russia, Northern Sea Route, Railway Transport and Transit, Transport and Logistics Centers, Communications between Economic Growth Centers, Development of Regional Airports and Routes, High-speed Railway Links, Inland Water Ways. The comprehensive plan for modernization and expansion of mainline infrastructure provides for investment of RUB 6.3 trillion with private investments making a half of them. RUB 927 billion are to be spent for implementation of the Sea Ports of Russia project between 2019 and 2024 with RUB 236 billion coming from the federal budget and the rest covered by non-budget sources. That is the bulk of private investments under the Plan. Marine infrastructure section of the Plan includes 98 projects in the Far East, North-West, Volga-Caspian and Azov-Black Sea basins. They will let increase the capacity of seaports in the Russian Federation by about one third, to 1.3 million tonnes. Among the most ambitious projects are the construction of a dry cargo area in Taman, development Murmansk Transport Hub including the construction of the coal terminal “Lavna” (Read more about the project implementation >>>>). Besides, the project includes activities on replacement of eight icebreakers with expired service life and strengthening of the fleet of icebreakers to ensure round-the-year operation of freezing seaports. Within a 6-year period, the Northern Sea Route project is supposed to get RUB 587 billion including RUB 266 billion from the federal budget. The first target of this project is to develop the Northern Sea Route, the second is to increase its cargo flow to 80 million tonnes per year. For that purpose, the Plan forecees the completion of the Global Maritime Distress and Safety System facilities and activities on navigational and hydrographic support of shipping on the Northern Sea Route to ensure navigation safety in its waters. Moreover, there is a plan to build hydrographic, buoy-lifting and rescue vessels of ice class as well as four icebreakers running on LNG (learn more about LNG-powered icebreakers at The Second Conference “LNG Fleet and LNG Bunkering in Russia” to be held in Moscow on 24 October 2018. Yury Tsvetkov, Deputy Minister of Transport of the Russian Federation – head of Rosmorrechflot (Federal Marine and River Transport Agency ) is in charge of the Inland Water Ways project with the allocations from federal budget to make RUB 276 billion. 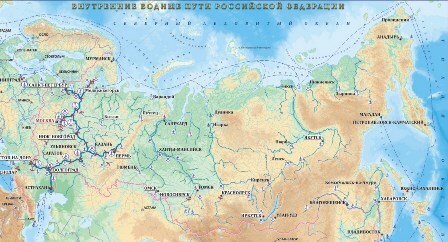 Implementation of that project will let increase the capacity of inland water ways by 14.3 million tonnes through financing of IWW and HES maintenance according to established norms and due to construction of the Bagayevsky and the Nizhegorodsky hydro systems on the Don and Volga rivers accordingly. The project also covers reconstruction of Moscow Canal infrastructure facilities to increase its annual capacity to 25 million tonnes.